For the last few weeks we’ve been working on the new Gnome contacts applications. Allan day has done most of the design for this and blogged about this recently. Today I did the first release of the ﻿code for the Gnome 3.1.2 release. While Allans post showed how the UI looks I’d like to go a bit deeper into the technical side. 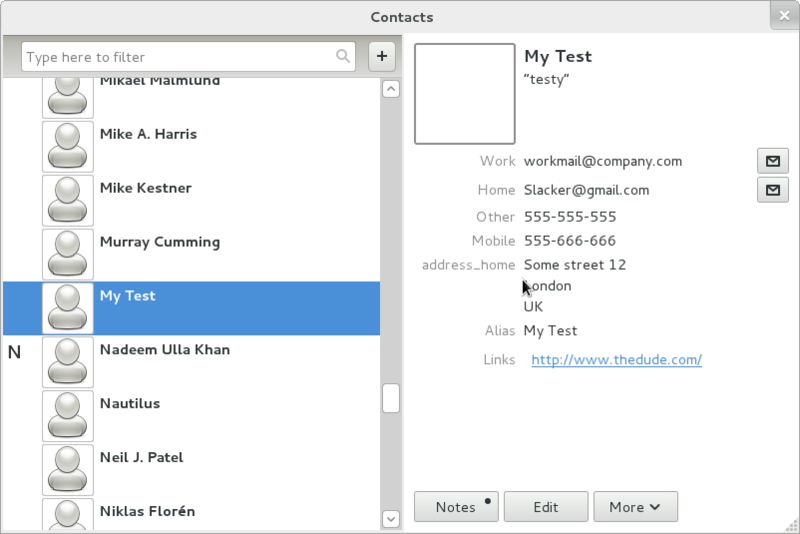 Gnome contacts uses libfolks for all access to contacts information. Folks then aggregates multiple sources of contact data, linking pieces of contacts into a whole. For instance, via telepathy it gets IM contacts and information about them, including presence status. Traditional addressbook information is taken from evolution-data-server (currently in progress) It can also connect to social websites such as facebook or twitter via libsocialweb. The social website integration at first seemed like a very interesting source of information for contacts, but it turns out that there are some non-technical problems with it. All these sites require an application specific key for API access that is generally not distributable, which is not very compatible with open source. Furthermore they have really harsh terms of service that limit what you can do with the service data and how you are able to present it (for instance twitter recently did some very harsh changes for 3rd party apps). So, while libsocialweb support is still available in Gnome 3.2 if you manage to set it up we’re primary focusing on IM integration (telepathy) and regular vcard style contacts. The default contacts store for libfolks will be evolution-data-server, which supports several backends including local databases and google contacts. These two will be the primary focus initially so that people can use local databases or easy sync with e.g. android devices via google contacts. Tomorrow I’m leaving for the IM, social and contacts hackfest in Cambridge where I hope to continue working on the contacts application and the frameworks its using. 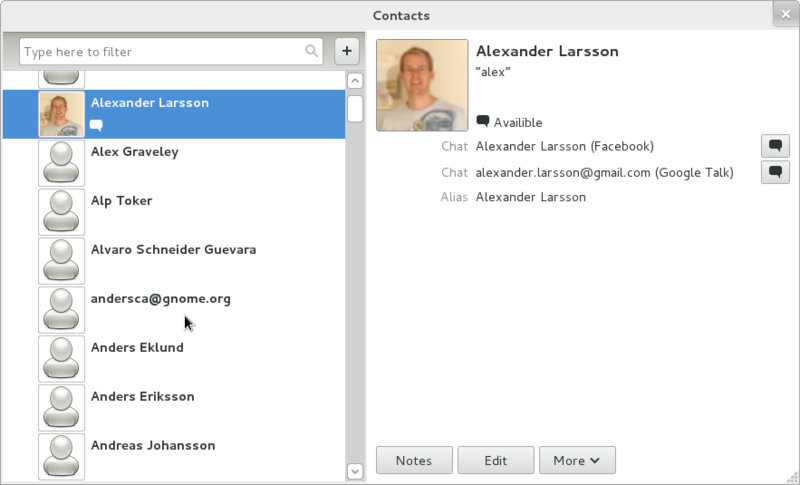 Also, we want to work on integrating contacts with other applications, including the gnome shell. For instance, it would be very nice if contacts appeared in the gnome-shell overview search. Yay, this is really cool! Please include an “obsolete” checkbox for each item of contact information. I want to associate communications from people’s old email addresses with the people but I don’t want to send new emails to their dead addresses. Likewise for phone, IM and other contact methods. Now we just need a descent calendaring app to go along with it! medeo: Its written in vala. Yes, it seems like a great addition to the desktop, especially for people not using Evolution. Now, we need a simple and elegant calendar application. Is it planned in a near future? will it sync with Android and other webservices? Nice, but can I exchange data with my existing Thunderbird adressbook? Another idea is downloading Facebook information A big dump of contact data. Its will possible import from Thunderbird address book? Pingback: Gnome Contacts will rock : It Even Works! Have you followed the design ideas of Daniel Siegel. I think their mockup is much more appealing and easy to use than the screenshot you’re showing here. mkind. No mailing list yet, but we should probably start one. Mail me personally for now.